Recording a singer accompanying themselves on an instrument can be a difficult task. When compared to recording instruments in isolation, there are a lot more things to consider to ensure a good quality recording. 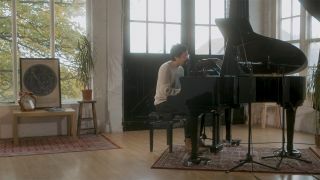 In its latest promo video for the new iD44 audio interface, Audient recorded the brilliant singer-songwriter Luke Sital-Singh performing his song ‘Time Is A Riddle’ on piano, whilst singing. The team at Audient needed to consider the different ways they could go about recording Luke on location to get the best sound possible. The crew made use of the four console mic preamps found on iD44, but didn’t expand further in order to avoid phase issues with more microphones. Isolating different instruments is a great way to make sure you have ultimate control over the different sound sources at the mix stage. However, when recording someone playing and singing at the same time, you will often find that when recording their instrument and voice separately, the performance could suffer. What is the point in lovely isolated tracks, if the performance and passion of the song is not there? You may have to record them at the same time, and work out how to minimise spill between microphones. The polar patterns of microphones are a great way to control spill between sources. This involves positioning them so the sensitive areas are pointed towards the source you want to hear and the null points are pointing towards the source you don’t want to hear. In the case of recording Luke, Audient made use of the AT4050’s cardioid pattern, pointing the null on the rear of the mic towards the piano strings. The piano mics were also cardioid and pointing directly into the piano, so the null was not pointing towards Luke’s mouth. Figure-8 mics would have been the best solution, however, in this situation, the piano was much louder than his voice, so the spill into the piano mics was not an issue. You can go down various paths to try and physically isolate the instrument from the voice by putting acoustic panels between them. Obviously, this will have different results with different instruments, and might actually cause more issues by distracting the performer. For recording piano, putting up some sort of acoustic material in front of the singer could help reduce the direct sound from the piano in the vocal mic, whether a reflection filter, or even acoustic panelling. At the end of the day, spill doesn’t necessarily have to be your enemy, so long as you have done what you can to reduce it. For acoustic music with a voice and single instrument, it may not be hugely important to have the control you would get from isolating instruments. Ensuring you have a high quality audio interface such as the Audient iD44, decent microphones, and good mic positioning, the track may only need a light touch in the mix, so having complete separation is not necessary at all. You can watch the final result here.